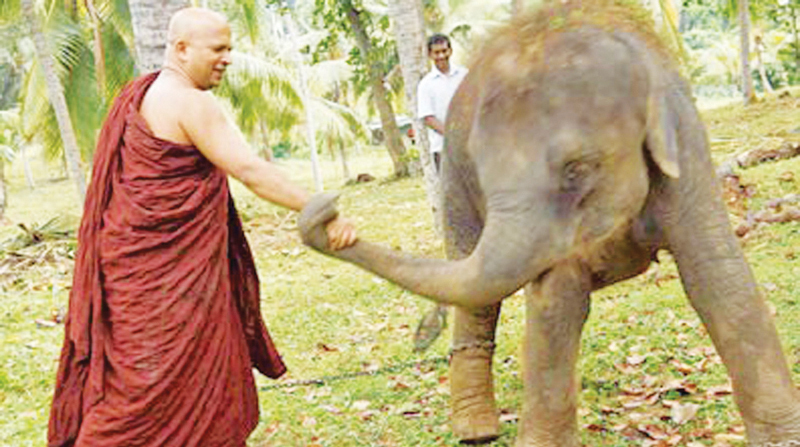 The case filed against Ven.Uduwe Dhammaloka Thera for allegedly having a baby elephant without a valid licence was yesterday fixed for judgement by Colombo High Court. Colombo High Court Judge Sampath Wijeratne hearing the case informed that the judgement will be delivered on March 1. Both prosecution and defence yesterday concluded their oral submissions before the trial judge. At a previous occasion, Colombo High Court concluded recording evidence from both prosecution and defence witnesses. The Attorney General (AG) had filed indictments against Ven. Uduwe Dhammaloka Thera on two counts for allegedly keeping a baby elephant without a valid licence in his temple. Senior State Counsel Janaka Bandara appeared for the Attorney General. President’s Counsel Prasantha Lal de Alwis and Counsel Maheshi de Silva, Chamara Wannisekara, Oshan Ubhayaratne and Samith Kalhara appeared for the accused.